I went back to Devil’s Kitchen in Platte Clove, this time to capture some of the strong contrasts in the morning light. Remember this little container, filled with Golden’s Neutral Gray Heavy Body Acrylics? 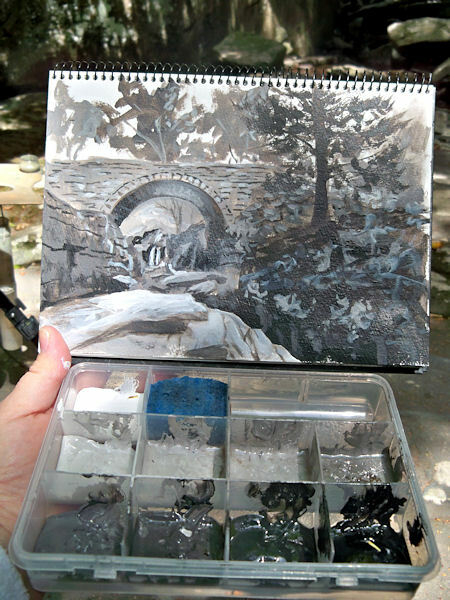 The lid supports my Shades of Gray watercolor sketchbook, and having the premixed shades and tints has turned value sketching from a chore into one of my favorite ways to paint. Here’s a picture of just the sketch. You can click it to enlarge it. The actual size is about 6×9″. The deep chasm in the right foreground is called Hell’s Hole. My goal was to take the viewer along that chasm and under the bridge, to the waterfall beyond. Although I’d not planned to do a color version of this scene, now that I’ve seen it in black and white, I really want to go back and do it again in color. 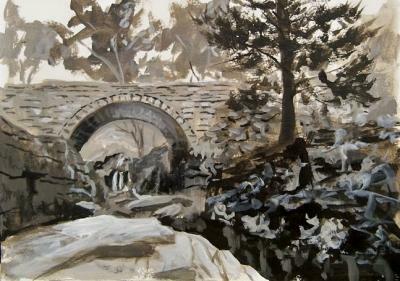 If you click here, you can see this bridge painted in oils from the other side on my Hudson Valley Painter site! 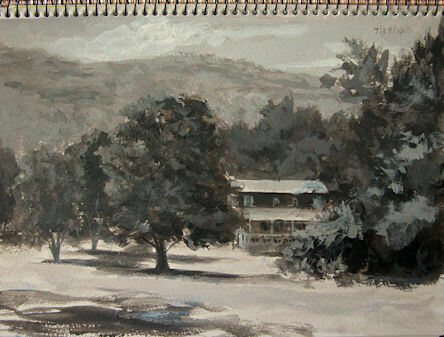 This is another entry in my Shades of Gray, monochrome value study book. 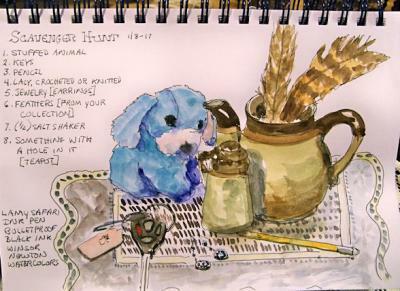 It was painted en plein air while out sketching with my friend Karen the other day. 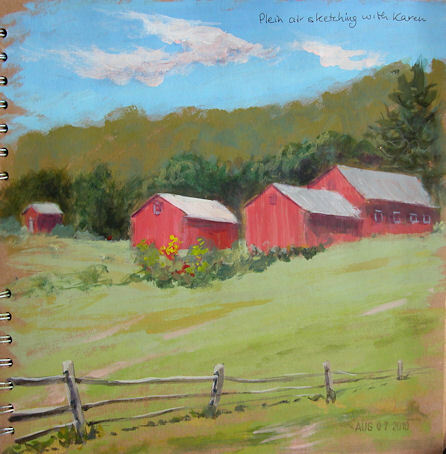 I’d already done the full color sketch of the red barns (which I posted a couple of days ago), and was waiting for Karen to finish up her painting. That was the perfect opportunity to pull out my container with the acrylic values already laid out and look for a second composition. I loved this curvy road going off into the distance, and it presented me with a wide range of values to work with. 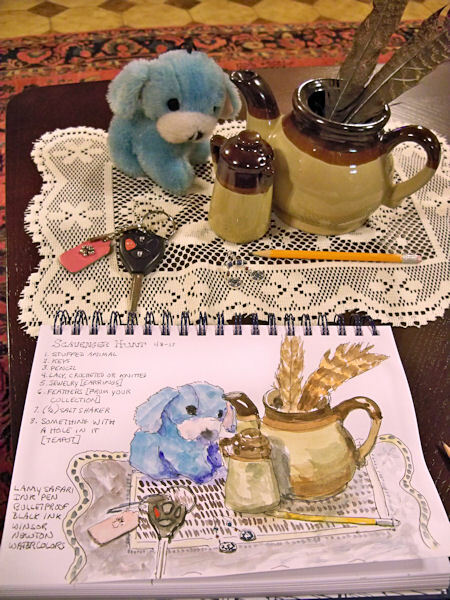 I went out painting with my friend Karen on Friday, and decided to do some sketches rather than a focused effort on a single painting. This was my first sketch of the day — beautiful barns up on the hillside that we’d been admiring on our painting outings for quite some time. This one was done with Golden Fluid Acrylics in my 10×10″ Kraft paper sketchbook. 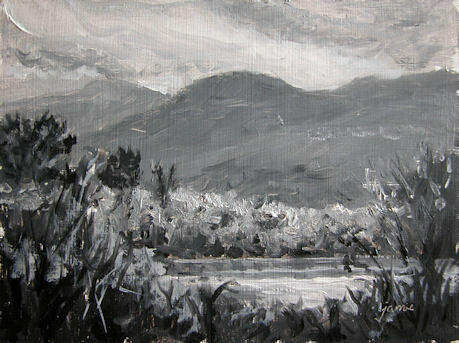 The little monochrome painting above was done at a pond up the road from me that has wonderful mountain views. I asked for permission to park and paint there, and the gentleman in the driveway said that his wife was also an artist, and that I should go knock on her studio door and say hi! Well, I did that and made another new artist friend in the area! It turns out that she will be in a show with me next weekend. Such a small world! Her studio overlooks this dramatic view, and she had an especially beautiful winter scene that she’d done from the window. 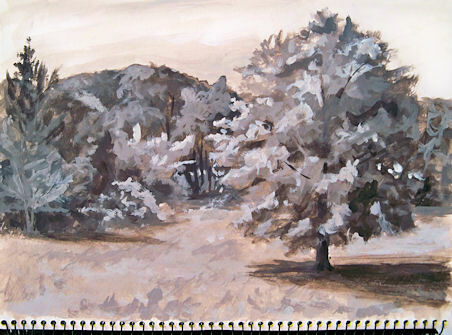 I used the opportunity to do a monochrome painting, then a limited palette painting. I’ll go back again and do a full color version. In addition to the value paintings I’ve been doing in acrylic, I have an oil painting setup to do monochrome studies easily and quickly in oils. I use the Judson’s Guerrilla Painter 6×8 watercolor box, Gamblin Light, Medium and Dark Portland Grays, plus Ivory Black and Titanium White. 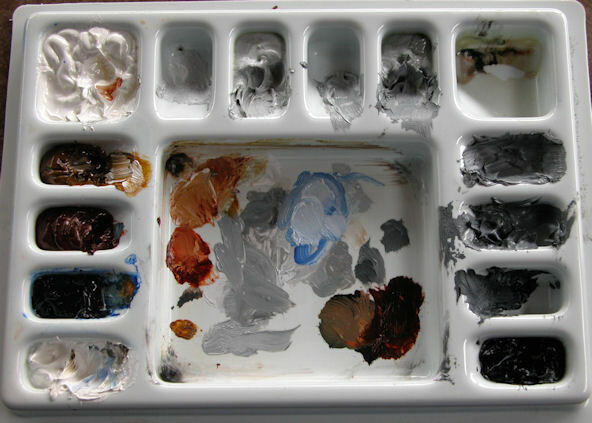 I also keep three colors in here for limited palette studies: Transparent Yellow Oxide, Transparent Red Oxide and Ultramarine Blue. (You can click this image to enlarge it a bit.) It has a cover, and fits right inside my 6×8″ Guerrilla pochade box. I’m starting to really love doing these monochrome studies. They are such wonderful practice for improving the way we see values. 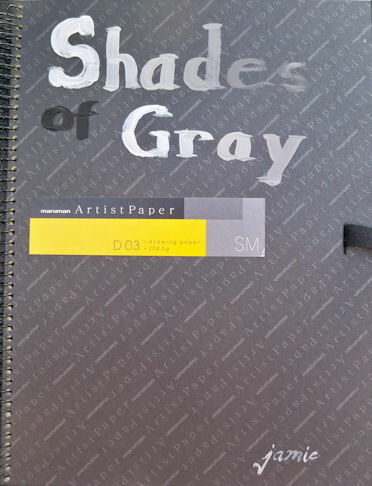 Having the pre-mixed Neutral Grays has made all the difference in the world, and has turned this from a tedious chore into a fascinating adventure. 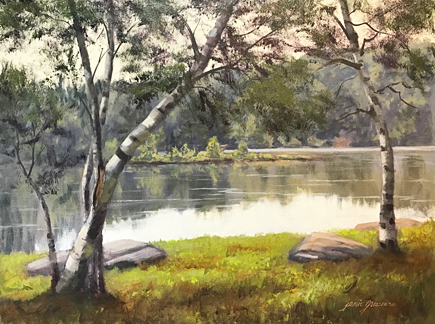 I sat outside in the yard in a comfortable chair after standing up and painting all morning, and painted this study under the shade of my favorite tree, with a cool breeze blowing. 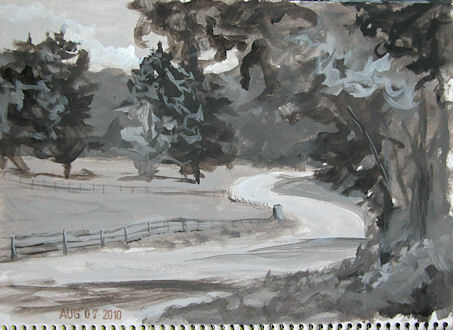 Continuing on with my monochrome value studies in acrylics, this one was added to my Shades of Gray sketchbook this morning. This was also done with the Golden Neutral Gray acrylics plus black and white. I think I’m starting to really enjoy these, much to my surprise! 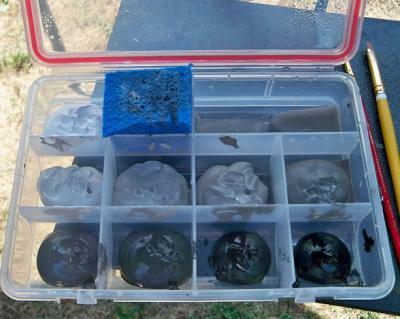 I set out Golden Heavy Body Acrylic Titanium White, Carbon Black, and all the Neutral Grays in between that Golden makes in a plastic container with compartments and a seal. Value studies are so important, but premixing all those grays ahead of time can be cumbersome enough to put it off time and time again. Now I have no excuses, and this container makes it so easy to pop the lid and paint at a moment’s notice. This book is about 6×9″. I’m reserving it for my value studies in acrylic, and have dubbed it “Shades of Gray”. Here’s the first page. 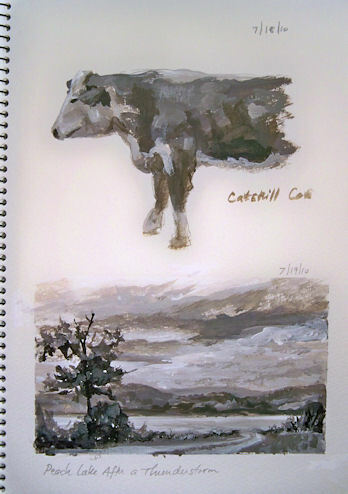 The cow was painted from a photo I took on Friday. The little landscape was painted here by the lakeshore this morning. Text: The forsythia came and went before I even had a chance to paint it this spring. I only saw my beautiful hyacinths blooming in the distance from the studio window! 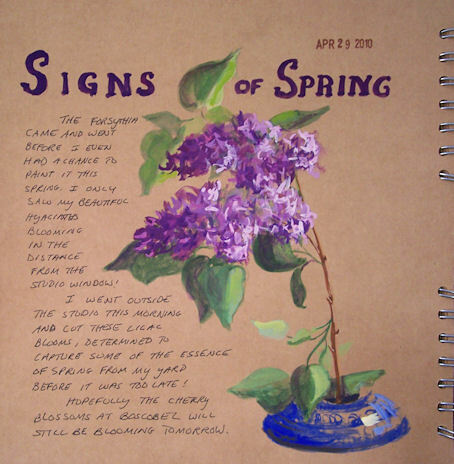 I went outside the studio this morning and cut these lilac blooms, determined to capture some of the essence of spring from my yard before it was too late! Hopefully the cherry blossoms at Boscobel will still be blooming tomorrow. 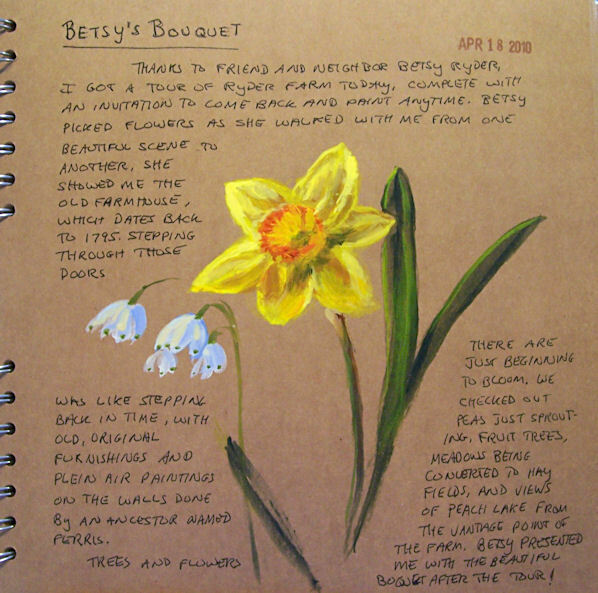 Thanks to friend and neighbor Betsy Ryder, I got a tour of Ryder Farm today, complete with an invitation to come back and paint anytime. Betsy picked flowers as she walked with me from one beautiful scene to another. She showed me the old farmhouse, which dates back to 1795. Stepping through those doors was like stepping back in time, with old, original furnishings and plein air paintings on the walls done by an ancestor named Ferris. Trees and flowers there are just beginning to bloom. We checked out peas just sprouting, fruit trees, meadows being converted to hay fields, and views of Peach Lake from the vantage point of the farm. Betsy presented me with the beautiful bouquet after the tour!